My baby is TWO! I can’t believe it has gone so fast! This post, and other posts like it, are mostly for my own benefit, so that I can look back on them and read about what Sylas was like when he was little. At Sylas’ two year well child checkup, he measured 31 inches (2’7″) and 20 pounds and 8 ounces. If you double your child’s height at the age of two, you will get an estimate of their adult height. Judging by his two year height, Sylas could be 5 foot 2 when he is an adult (a teeny fella like his momma). Sylas is in LOVE with tractors and Thomas the Train. It is all he will play with. His Uncle Stephen got him a fancy Thomas the Train track for his birthday and that is all he wants to do. It has been a week since he got it and we have already changed the batteries twice! He also likes to watch Mickey Mouse TV shows at the moment, along with Bugs Bunny and Road Runner. He is also going through a phase with owls. He has a toy owl and he loves telling everyone about the noise it makes. We take it everywhere. Some Saturday mornings the Jack Hannah’s adventure is on TV and they have owls on the show and Sylas is enamored with them. He loves to eat grapes and cheese. He is very much a fruit kid like his mommy is. He still has a thing with meat, especially ground beef or shredded chicken. He will eat ham sandwiches and chicken fingers but his taste buds don’t venture too far from those in the meat portion of the food pyramid. He likes fruit gummies a little too much. If he could have it his way, he would eat them for breakfast lunch and dinner. He is also a smarty pants! He is learning his numbers and can count to three without help and get to ten in English and Spanish while repeating us. He has a big vocabulary and is going through the repeat-everything-you-say phase. Unfortunately that phase also means that he sometimes calls daddy Javier instead because he is imitating mommy. He also says oh, shoot a lot. It is a phrase that my dad and brothers use and Sylas has really picked up on it and knows in which situations to use it. If one of his trains derails from the tracks he says “oh, shoot!” We are working on erasing that one from his words but its not that easy. He also says this word that I have yet to figure out its meaning. He shouts it and gets really intense as he says it over and over. There is no consistency in the time in which he says this word. Sha-noun is what he says. He also still has his toddler lisp; he pluralizes everything and its so cute! Most of his nicknames for everyone are also plural: mommies, daddies, gwammas, ohnos (ellenore, my brother’s girlfriend). He calls my brothers cecum and ecum (Stephen and Ethan). Cecum has an unfortunate nickname; in case you didn’t know, cecum is a part of the bowls. 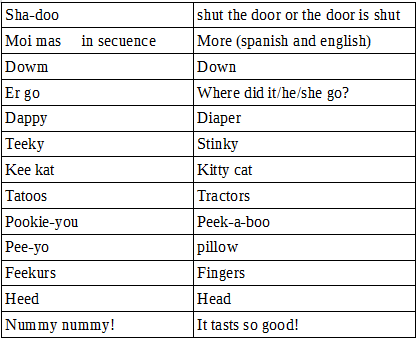 For your reading pleasure, I made a list of toddler speak words and their translations. So that’s an overview of Sylas at two years old! This entry was posted in Mom rambles and tagged baby, blogger, christianity, faith, God, mom, mommy, Sylas, Thomas the Train, toddler, toddler logic, two, two year old, update. Bookmark the permalink.